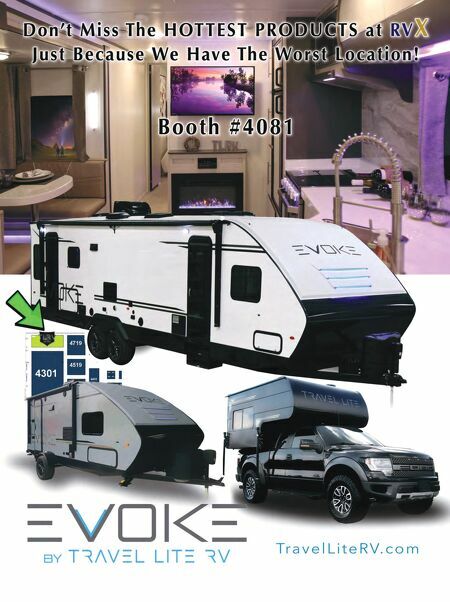 rv-pro.com March 2019 • RV PRO • 113 rv-pro.com March 2019 • RV PRO • 113 marine crossover and the annual RV Industry Association After- market Conference. Bob Marshall, vice president of business development for Periodic Products, was one of the first-time exhibitors. "We are introducing a new product to the industry and what better way is there than to attend a show," Marshall said of his reason for exhibiting. 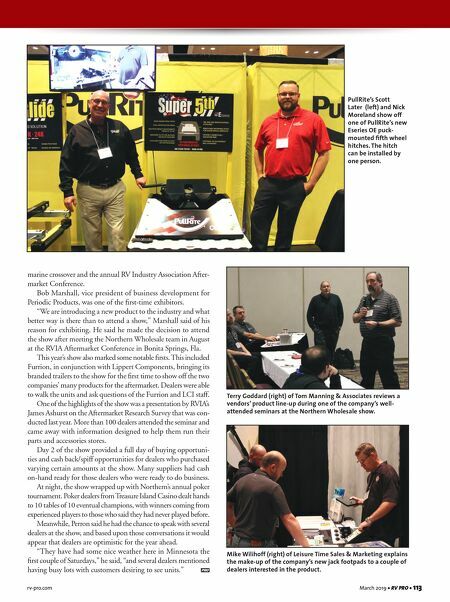 He said he made the decision to attend the show after meeting the Northern Wholesale team in August at the RVIA Aftermarket Conference in Bonita Springs, Fla. This year's show also marked some notable firsts. This included Furrion, in conjunction with Lippert Components, bringing its branded trailers to the show for the first time to show off the two companies' many products for the aftermarket. Dealers were able to walk the units and ask questions of the Furrion and LCI staff. One of the highlights of the show was a presentation by RVIA's James Ashurst on the Aftermarket Research Survey that was con- ducted last year. More than 100 dealers attended the seminar and came away with information designed to help them run their parts and accessories stores. Day 2 of the show provided a full day of buying opportuni- ties and cash back/spiff opportunities for dealers who purchased varying certain amounts at the show. Many suppliers had cash on-hand ready for those dealers who were ready to do business. At night, the show wrapped up with Northern's annual poker tournament. Poker dealers from Treasure Island Casino dealt hands to 10 tables of 10 eventual champions, with winners coming from experienced players to those who said they had never played before. Meanwhile, Perron said he had the chance to speak with several dealers at the show, and based upon those conversations it would appear that dealers are optimistic for the year ahead. "They have had some nice weather here in Minnesota the first couple of Saturdays," he said, "and several dealers mentioned having busy lots with customers desiring to see units." PullRite's Scott Later (left) and Nick Moreland show off one of PullRite's new Eseries OE puck- mounted fifth wheel hitches. The hitch can be installed by one person. Terry Goddard (right) of Tom Manning & Associates reviews a vendors' product line-up during one of the company's well- attended seminars at the Northern Wholesale show. Mike Wilihoff (right) of Leisure Time Sales & Marketing explains the make-up of the company's new jack footpads to a couple of dealers interested in the product.